I'll put the recipe last. It is one I scarfed up from a reference on Reddit, and the page is here, and it flew past while I was sitting staring at the TV. It is as few ingredients as I have ever seen for bread, and I was skeptical. They tasted well, but there was a problem. I've been banging on about using High Gluten Bread Flour for a while now. It gives great results but I have to add back extra water. The flour just soaks it up. A "regular" all purpose flour does not. I wanted proof. The proof is in the pictures. What happened was that I made the recipe "Precisely". I measured the water out exactly, warmed it to 108F in the microwave, added the ingredients with Flour last. Mixing time was done in the Bread Machine simply because I'm lazy. The High Gluten Flour required an extra 2 ounces of water, and I think I could have added more. The All Purpose Flour could have used less water. It turned out very sticky and hard to manage. All other measurements are exactly as below. I simply added water, then salt and yeast, then flour and pressed start on my bread machine. I was geeking out and really wanted a clear view of what the difference was. The results were predictable. The High Gluten Flour batch was a bit denser than they should have been since they needed extra water. The All Purpose Flour batch had to be cooked longer and turned out with an odd texture that wasn't so much chewy as it was thick and almost rubbery. Mind you, I had the all purpose flour rolls last night and they tasted fine, but the texture was "off". They would both have been better if they had the right amount of water... or a more patient baker. You will notice below that the recipe specifically implies that you're mixing in the water "to conditions" so that you get a dough that is "right". I was doing it scientifically to prove a point. It was so simple that I didn't mind doing it wrong to "learn" the recipe. I allowed 2 hours rise time in a warmish (78F) house. Recipe follows. I found the recipe on this page. The rolls were good, just the texture needed fine tuning. Less water for All Purpose flour, More still for High Gluten. 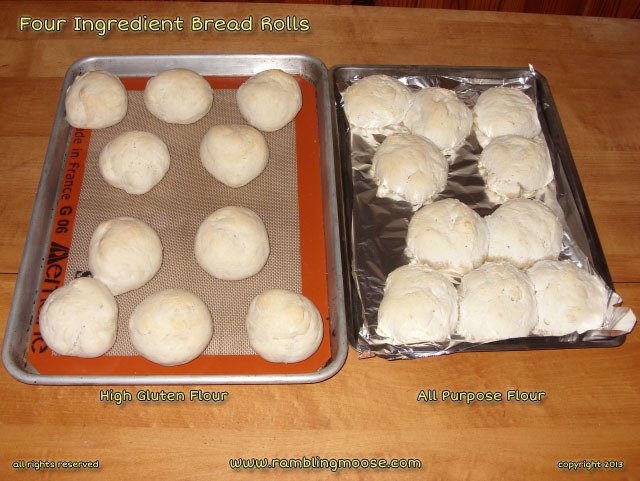 I cooked the rolls at 450 for 13 minutes (or until done). Mix everything together. If it is too wet and won't come free from the sides of the bowl or keeps sticking to your hands, add a little more flour. If it is too dry and won't form into a ball, add a bit of water. Knead it for 10 minutes. Cover and set it aside to rise until it doubles in size, approximately 90 minutes. Punch it down and let it rise again. Shape it, either by putting it in a greased loaf pan or by rolling it out into a long loaf and putting it on the back of a cookie sheet. After it has risen to twice it size again, another hour or so, put the loaf into a preheated oven at 375 degrees. Let it bake for 45 minutes and then pull it out. If you made it into a long skinny loaf, it may cook 5 or 10 minutes quicker, so adjust the time based on what shape you chose. I baked the loaf in these photos for 40 minutes). 350-375°F for 45 minutes is typical for a loaf in a loaf pan.